1. 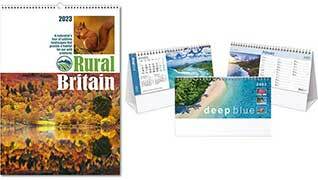 We are one of the U.K.'s leading suppliers of promotional calendars. 2. Over 430 titles to choose from. 3. Four different calendar collections to choose from. 4. Low prices with no hidden costs. 5. FREE artwork for your organisation's branding. 6. 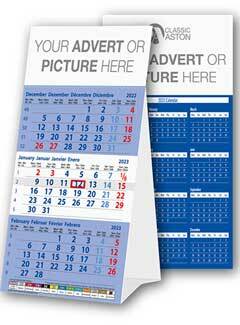 FREE proofs before we print your advertising calendars. 8. FREE carriage on all "Aston" calendars. 9. Bespoke calendar specialists. Use your own images! 10. Extensive copyright-free image library for you to use. 12. Nationwide delivery at a time to suit you. 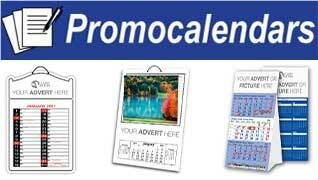 Promocalendars supply promotional calendars from all of the U.K. manufacturers. 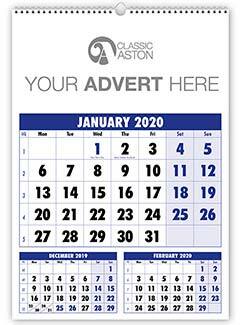 We are distributors for Reeve, Brunel, Rose and Aston and we believe we offer the lowest prices for advertising calendars within the country. On this website there are over 430 titles to choose from and many of our personalised calendars are now in postage saving friendly format. 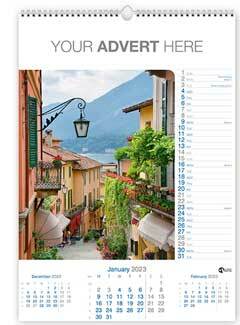 Promocalendars are also specialists in tri-monthly shipping calendars and we now have four styles of shipping calendars to select from. We offer free artwork and our graphic studio will produce a free proof for your approval before we print your branded calendars. 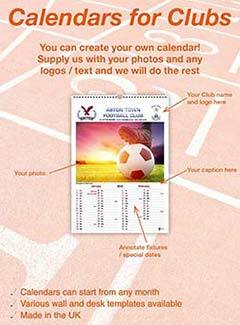 Please select from the menu at the top of this page or click on the pictures below to view detailed information and images of all of our custom calendars. You can also download price-lists and there are no hidden extras! 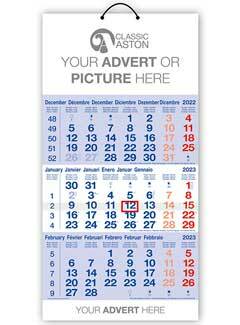 All of our promotional calendars are supplied with mailing envelopes. New for 2019 completely interactive promotional calendars from Reeve! Every page on this new unique calendar links to an online 360 degree panoramic experience of the views on the calendar. Simply scan the QR codes on each page with your smartphone or tablet and then become immersed in a fantastic 360 degreee virtual reality tour. Calendarpod Midi is our featured calendar for 2020. 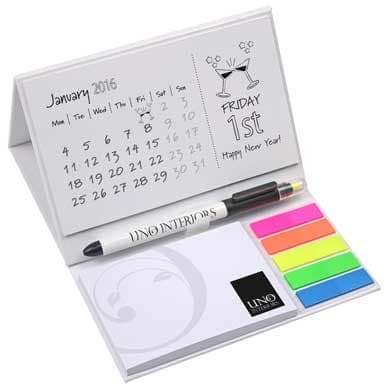 It combines a useful calendar, a sticky note pad, index tabs and is supplied exclusively with a Senator Duo Pen. This is a twist ball pen and a highlighter in one! We can personalise the sticky notes, the calendar, the Duo Pen and the hardback cover. 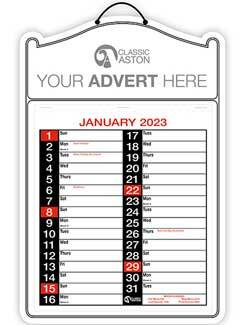 This personalised calendar will really wow your customers and they are bound to see your advertised message all year round. The Calendarpod Midi is supplied individually bagged and folds flat for easy posting. Size 155mm x 430mm. Hardback cover contains one A7 (100 x 75mm) 50 sheet sticky note pad and five 25 sheet plain index tabs. 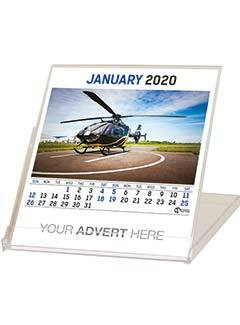 12 gloss calendar sheets (149 x 99mm ) - 1 month to view. Senator Duo Pen - a twist ball pen and highlighter combined. Indvidually bagged. The very latest technology has been introduced to these amazing interactive calendars available from our Reeve calendar collection. Every page on this new unique calendar links to an online 360 degree panoramic experience of the views on the calendar. Simply scan the QR codes on each page with your smartphone or tablet and then become immersed in a fantastic 360 degreee virtual reality tour. For an example please visit www.360interactivecalendars.co.uk/thousandisland New for 2020 you can now enjoy a full virtual reality experience of this calendar by inserting your mobile phone into the virtual reality headset (available at additional cost and supplied flat packed). You will be fully immersed in the panorama and you will believe that you are truly there. The experience will make you feel like you are flying above the calendar location! The receivers of these interactive calendars will be truly amazed and your advert and brand will be forever linked with this modern technology. 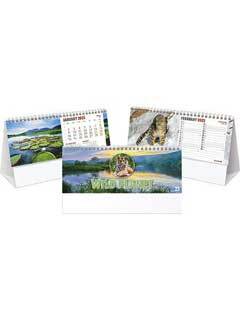 Your customers will truly love these mini tri-monthly desk shipping calendars. They are small enough to fit comfortably on top of your customer's desktop and your advert will be prominently displayed. The calendars are supplied with a sliding cursor and date highlighter and will be delivered inserted into mailing envelopes. The international dates and holidays for the U.K.'s top twelve trading partners are shown and we will print your advert in full colour. On the rear is a useful yearly planner and another opportunity to print a message. 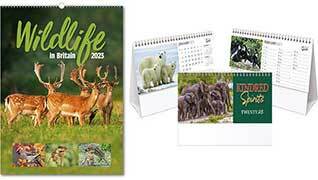 These calendars are fabulous value at £2.99 for a quantity of 200. Please contact us for prices for other quantites. 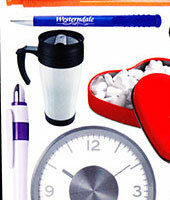 Looking For Other Types Of Promotional Gifts? Please visit our sister website at Printit4u to view hundreds of alternative promotional gifts. Many of our customers also like to give advertising diaries and branded notebooks to their customers. Personalised Castelli diaries styled in Italy and branded here in the U.K. make a beautiful business gift. Why not consider low cost promotional pens or in our inclement weather a printed umbrella is always popular. If you would like to see your message and advert on your customer's desks then consider promotional adpads or personalised sticky notes. At Christmas time why not send personalised christmas cards to your most loyal customers? Low cost technical gadgets such as printed usb drives along with promotional mouse mats also make excellent business gifts. Everybody likes to break their day with a cup of tea or coffee and a promotional mug will always be well received. 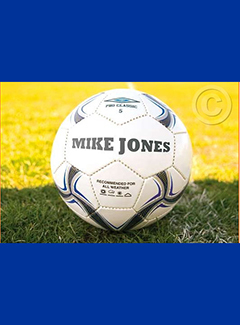 Many of your customers might also be keen golfers so why not consider personalised golf products or personalised golf balls? Everybody has a set of keys and promotional key rings make an excellent low cost advertising gift. Printit4u always have special offers on advertising gifts and so please visit for your next marketing campaign.